Rosa Alchemica. L'Hyperchimie. Revue Mensuelle d'Hermetisme Scientifique. 1902-1904 Douai, France. Language: French. Editor: Francois Jollivet-Castelot. Succeeds: L’Hyperchimie Succeeded by: Les Nouveaux Horizons->Rose+Croix Douai/Clairac) 7/1, January 1902-8/12, December 1904. Primarily alchemical even though the journal claims as its fields of interest: "Alchimie, astrologie, magie, sciences psychiques, physiognomie, chirologie, graphologie, therapeutique, mystique, theurgie, esthetique." BNF; Bibliotheque interuniversitaire Sainte-Genivieve. 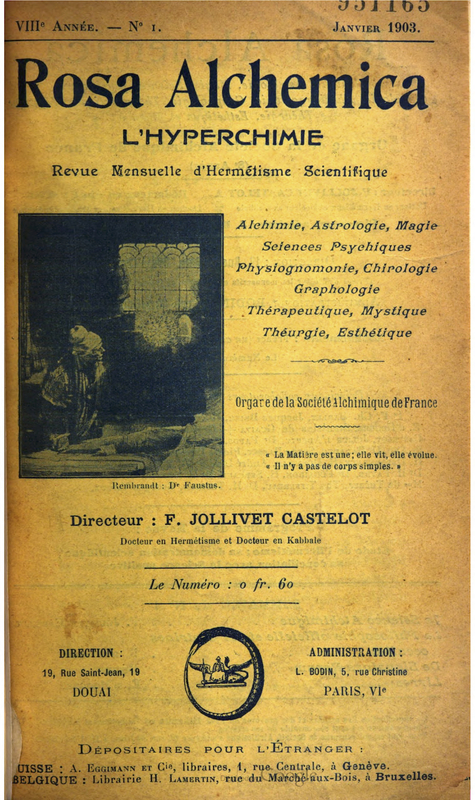 Jollivet-Castelot (1874-1937 ) had become a Docteur en hermetisme et docteur en kabbale in l’ecole superieure libre des sciences hermetiques de Paris organized by Papus (Gerard Encausse), and was the head of its Alchemical section and of the Societe Alchimique de France, which he founded. Unlike Papus, however, he concentrated his efforts on one subject primarily-alchemy-which he envisioned as the midpoint between metaphysics and chemistry. In later life he claimed to have made gold by alchemical means in his laboratory. The collaborators in the review included F.-Ch. Barlet (Albert Faucheux), Stanislas de Guaita, "Marc Haven" (Dr. Emmanuel Lalande, 1868-1926), et al. In the 1920s he expanded his interests to communism and wrote several books on Jesus et le Communisme (1926) and Le Communisme Spiritualiste (1925), and founded the Union Communiste Spiritualiste (1925). BNF.